Nope, not a Lionhead! This is a chinchilla Jersey Wooly in the middle of a severe molt. It'll be okay, don't worry. Here are several areas on pet, show, and meat rabbits where fur is commonly lost, and the causes and cures. 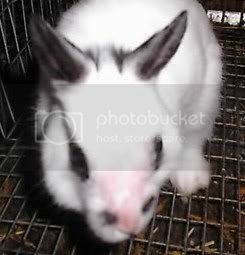 A rabbit with bare spot can still be shown in most breeds. It is only a disqualification from competition in the Dutch breed. 3. brown crustiness in the ear, indicating ear mites or fur mites. If the problem is not due to parasites, try to breed this rabbit with one that has better fur covering on the ears if the problem is pronounced. Abscesses often need to be lanced and/or treated with antibiotics (check with your vet). For moist dermatitis, I would use a water bottle placed higher than usual and place a purple wound powder, made for horses, on the affected area. Check out your feeders for sharp or rough edges. Plastic feeders, too, can start ripping out fur once the rabbit has chewed the edge into a rough pattern. Although fur missing over the shoulders could be barbering by a neighbor or the start of a molt, chances are that if you blow into the poorly furred area, you will see dander, the telltale sign of fur mites. Authorities seem to disagree about how to treat fur mites. I use ivermectin and it works for me. Occasionally I’ll have a rabbit look as though I took a razor and removed a strip of fur from neck to tail. Sometimes it is down the middle. Sometimes it is to one side. As bizzare as it looks, it’s just the start of a rabbit shedding. I love this sort of molt because, in my experience, the molt goes very fast. It’s also amusing to watch. Blame the neighbors for this one. The missing fur is most likely caused by barbering. You can add a layer of hardware cloth to the cage wall to keep teeth on the correct side of the cage wall. Missing fur on paws is just one step away from sore hocks, in my opinion. 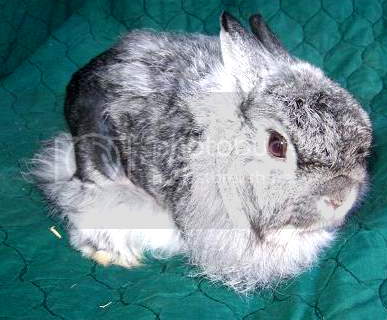 It amazes me how many rabbits have worn fur on their feet that come across the show table, especially rex furred breeds. Keep an eye on those feet and treat for missing fur so that you don’t have to treat for sore hocks. You can improvise a resting board from wood or other smooth surfaces. Or you can purchase pre-made resting pads that allow waste to drop through. When you think about all of the things that can happen to fur in addition to normal molting, it can really make one appreciate a great fur even more. This article by Laurie Stroupe.